Indonesia catering market has surged owing to the growing number of international tourists, domestic air travelers, wedding ceremonies being held in the country, higher catering demand from industrial clients (hospitals, mining sites, manufacturing plants, oil & gas sites and educational institutes requiring catering services) and the positively inclining number of MICE/corporate/private events being hosted in various event-halls across the country. The market witnessed a robust CAGR of ~% during the review period (2012-2017) due to the combined effect of these factors. The market is currently placed in medium growth stage with strong possibility for further growth at a faster pace. Profitability associated with catering is highly correlated with multiple factors such as maintaining records of profit/loss statements during various individual events & its effective interpretation, cost reduction related to transportation of raw materials, minimization of wastage, sustaining & expanding client relationships, having multiple event halls with different capacities, quality of food being served, efficient & effective service provided amongst various others. Estimated profitability range for event and pure-play caterers has been analyzed to be ~% in 2017. Highest profit margins per person have been charged in the hospitality catering sector by star-hotels. A 4 star hotel has a small size ballroom, which is generally divided into two rooms for hosting different events with an accommodation capacity of about ~ people. The average number of meeting and function rooms in 4 star hotel ranges from ~, where corporate events take place. 3 star hotels focus on hosting all types of events at very reasonable prices, which limits their revenues in comparison to other players operating in the space. Such entities contributed USD ~ million to the market revenues in 2017. Major airline companies in Indonesia consist of two food related departments running in parallel. These are airline’s catering department and F&B department. Catering division could be a pure service extended by the parent airline. However, from the business perspective, since catering is not really a core competency of the airline, caterers are able to supply to multiple airlines and leverage revenues from where ever possible. Two major parts of the catering division sub-sectors include Meal Design and Meal Planning. The entire catering procedure involves various processes and sub-processes starting from menu standardization of different flights. The airline company then provides quotations, provides the caterer with meal presentation requirements, set up their meal policy, run material requirement plan and estimate monthly consumption, generation of production schedule and then enters flight catering order. There are certain challenges faced by the in-flight caterers in Indonesia. The overall cost is comprised of ~% logistics cost, whereas ~% adds up to the cooking and catering expenses. This is due to the heavy cost of refrigeration, cooling, transporting and others. It is highly important to focus on maintenance of temperature so that the food remains in fresh conditions even after few hours. The caterers have to make sure that the food doesn’t contain too-much of fat content, which is difficult to digest by the passengers during the flight. Currently, PT Reska Multi Usaha caters to the food requirements in Indonesian Railways. This daughter company was established in 2003. It is a subsidy of PT Kereta Api Indonesia, working in various segments for parent company. These include catering, restaurants, parking, cleaning service and general trading. The company has been undergoing changes, modifications and up gradation since 67 years of its establishment. Every train usually has a catering car located in the central area of the train. The Company has ~ central kitchens in Bandung, Jogja and Manggarai Indonesia railway catering market size has been estimated to be approximately IDR ~ billion in 2017. Per Day: PT Reska Multi Usaha generates IDR ~ million daily through food catering in Indonesian in 2017. ~ Meals served per day in 6 regions through train catering. Jakarta & Surabaya comprise of ~% share of the total meals supplied in 2017. Event planning or event management consists of organizing large scale festivals, wedding ceremonies, private ceremonies, conferences, concerts and business conventions on behalf of end-users by directly dealing with major hotels, weddings halls and event halls. Different events have their own peculiar requirements hence, event planners deal with budgeting, scheduling, site selection, acquiring necessary permits, coordinating transportation and parking, arranging for speakers or entertainers, arranging decor, event security, catering, coordinating with third party vendors, and making emergency plans differently for varied occasions. Meeting tight deadlines, fitting event finances in tight budget, high client prospect and organizational stakes, temperamental clients, managing dependencies, language barriers, technological glitches and converting event plans on paper into a reality are the various issues faced by event planners in Indonesia. There has been an increase in the number of destination weddings in Indonesia by the end of 2017. Growing popularity of the serene beauty of Indonesian landscape, low price in comparison to resident country and trend-popularity have been the major reasons for this growth. The venues for destination events are majorly located in remote areas such as small islands, cliffs and other exotic places hence, this concept is usually popular for destination weddings in comparison to MICE events. On the other hand, average price per person for destination weddings is more than IDR ~ per person. Remote islands near Bali form clusters for such types of weddings in Indonesia. For destination weddings people mostly come from Australia and various European countries. People from United Kingdom have come in huge number in 2017. The overall competition stage of the industry has been a mix of fragmented and concentrated scenarios depending on major sectors of the market. For instance, hospitality sector and the market for pure play caterers is highly fragmented whereas, in-flight & industrial catering sectors have been marked with highly concentrated competition scenarios. There were approximately ~ food catering entities operating in 2017 providing food catering services along with providing supplementary facilities such as flower decoration, parking facilities, seating arrangement, cutlery and others. Few of the major players include Sasana Kriya, Hilton Garden Inn, Conrad Bali, The Royal Santrian, Hard Rock Hotel Bali, Holiday Inn Jakarta, Holiday Inn Express Jakarta Thamrin, PT Indocater, CAS Group, Aerofood and others. The pre-requisite of heavy investment into setting up a full-fledged production facility and establishing a large distribution network has prevented stakeholders to scale their businesses over a certain geographic limit. This also proves to be barrier in the entry of new players. Presence & expertise of major players, large geographical out-reach (especially to remote sites), diversity in menus, larger capacity of event halls, well established & exclusive clientele has helped these major players to assemble higher revenue share in the market during the review period. In the short-run, the market has been anticipated to grow to USD ~ million by the end of 2020 registering a three year robust CAGR of ~% during 2017 to 2020. 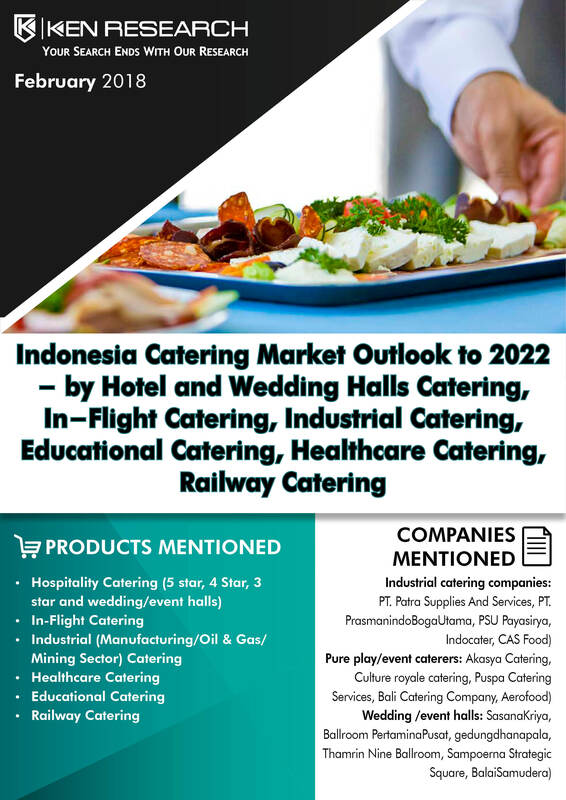 In long run, it has been analyzed that Indonesia catering market would register a steady five year CAGR of ~% during 2017-2022 and hence attain a market size of USD ~ million by 2022 from USD ~ million in 2017. Indonesia would become a hub for hosting successful MICE and destination events in the coming future. Increase in the number of wedding/event halls, construction of new hotels with more number of ballrooms and meeting rooms, expected increase in the number of foreign tourists, rise in the number of healthcare centers with more number of in-patients and expanding industrial units demanding catering services would help facilitate the growth in the market size. Rising number of private and MICE events is expected to be the major reason behind the dominant share of hospitality sector in the revenues of overall catering market on Indonesia by 2022. Hospitality sector is expected to contribute ~% to the overall revenues generated by catering companies in Indonesia in 2022.